Formula One is testing in Bahrain this week, and surprise! McLaren had issues. Sauber, one of two teams yet to score a point this season, logged 106 laps of the Bahrain International Circuit on Tuesday, per Autoweek. Fellow pointless team McLaren only got 16 laps done that day, thanks its Honda power unit, which still doesn’t work. McLaren’s problem on Tuesday, the first day of testing, was a water leak that affected the energy recovery system for the power unit’s hybrid system, notes Motorsport.com. That incredibly dangerous combo of liquid and electrics really ought to earn Honda a new medal for Achievements in Failing. This Bahrain test is one of only two in-season tests for Formula One, and today is the last day. McLaren has to be in full catch-up mode already. Oops! 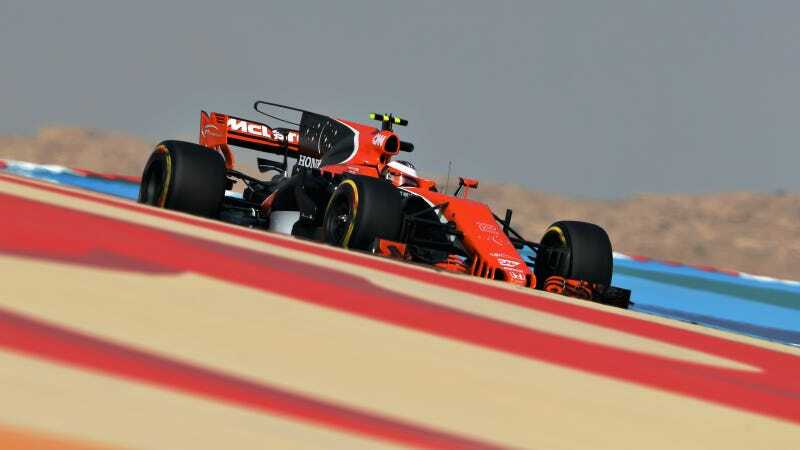 Test driver Oliver Turvey wanted to get some serious time in the car, as Honda originally planned to have a new, improved power unit ready for the Bahrain test, but failed to produce it in time, reports Autoweek. In the meantime, Honda was hoping to upgrade the existing power unit just enough to get by until the new version was (hopefully) ready later this month. However, they can’t seem to get enough run-time to gather valuable data on any of the ideas they wanted to try out in Bahrain because the current Honda power unit is that much of a turd. Fortunately, Motorsport.com says that McLaren finally got to test like a big-time, functioning Formula One team this morning, with Stoffel Vandoorne logging 49 laps in the first half of the day. Come on, Little Orange Car That Couldn’t—it’s time to show that you can work! Go, McLaren, go!